^ Sir Alexander Chapman Ferguson. mufcinfo.com. [2011-07-12]. ^ Alex Ferguson. London Hearts Supporters' Club. [2011-12-05]. ^ Bell, Stephen; Zlotkowski, Andre. Scotland XI Tour of Asia and Oceania 1967. Rec.Sport.Soccer Statistics Foundation. 2008-06-06 [2011-03-05]. ^ Russell Hoye; Aaron Smith; Matthew Nicholson; Hans Westerbeek; Bob Stewart. Sport Management, Volume 1, Second Edition: Principles and applications. Elsevier. 2009: 168. ISBN 0-7506-8755-X. ^ Hunter, James. Steve Bruce: Sir Alex is the best manager ever. Newcastle Chronicle. 24 December 2010 [18 October 2015]. ^ Hayward, Paul. Sir Alex Ferguson's adaptability has made him the greatest of all time. The Guardian. 5 November 2011 [9 November 2015]. ^ Macintosh, Iain. Greatest Managers, No. 1: Ferguson. espnfc.us. 9 August 2013 [9 November 2015]. 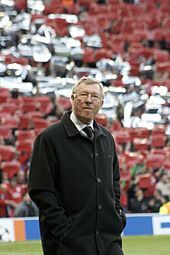 ^ Ferguson set to eclipse Busby as Manchester United's longest-serving manager. The Guardian. 2010-12-02 [2015-06-13]. ^ 9.0 9.1 Sir Alex's crowning glory. BBC News. 1999-07-20 [2015-06-11]. ^ Sir Alex honoured again. BBC News. 1999-06-02 [2015-06-11]. ^ Sir Alex Ferguson is going to retire at the end of the season. BBC News. 2013-05-08 [2015-06-11]. ^ Ladyman, Ian. From Queen's Park to King of England: Fifty amazing years in football for Fergie. Daily Mail (London). 2008-11-14 [2011-07-12]. ^ Details of Queen of the South 7 v 1 Queens Park including Ferguson's recollection in the Ivor Broadis career profile. Qosfc.com. [2013-10-04]. ^ Ibrox glory was making of wee Alex Ferguson - long before he became king of Old Trafford. Daily Mail. [2013-11-26]. ^ Scotland — List of Topscorers. Rec.Sport.Soccer Statistics Foundation. 2009-06-12 [2009-10-30]. ^ 18.00 18.01 18.02 18.03 18.04 18.05 18.06 18.07 18.08 18.09 18.10 18.11 Crick, Michael. The Boss: The Many Sides of Alex Ferguson. Pocket Books. 2003. ISBN 0-7434-2991-5. ^ 19.0 19.1 Adams, Billy. Sunday Herald St. Mirren article. The Sunday Herald. 1999-05-30 [2007-11-09]. ^ Sir Alex lifts the lid. 2004-05-04 [2007-11-09]. （原始内容存档于2008-12-27）. ^ Campbell, Nicky. Guardian bullying article. The Guardian (London). 2006-01-12 [2007-11-11]. ^ 31.05.1978: Alex Ferguson is fired by St Mirren. The Guardian (UK). 2008-05-31 [2008-12-29]. ^ Lewis heads sporting honours. BBC News. 1999-12-12 [2007-06-18]. ^ Ewan Murray. Sir Alex Ferguson rejected 1986 chance to become Arsenal manager. theguardian.com. [2013-10-04]. ^ Fergie Steps Down. Evening Times. 1986-06-16 [2011-06-10]. ^ Davies, Gareth. Top 10 Fergie decisions: Saying 'No' to Spurs and Arsenal. The Sun (UK). 2009-05-15 [2011-02-25]. ^ 28.0 28.1 28.2 28.3 28.4 28.5 28.6 28.7 Four decades of FERGIE TIME: Sportsmail looks back over retiring boss' remarkable 27 years as Manchester United manager. Daily Mail (UK). 2013-05-08 [2013-12-03]. ^ Arise Sir Alex?. BBC News. 1999-05-27 [2013-12-03]. ^ Sir Alex Ferguson's 20 years at Manchester United. BBC Sport. 2006-11-06 [2013-12-03]. ^ Ornstein, David. Ferguson hungry for more success. BBC News. 2009-05-22 [2013-12-03]. ^ 33.0 33.1 Bevan, Chris. How Robins saved Ferguson's job. BBC News 4 November 2006. 2006-11-04 [2013-12-03]. ^ 20 years and Fergie's won it all!. Manchester Evening News. 2006-11-06 [2009-08-08]. （原始内容存档于2012-12-05）. ^ Jones, Ken. Recalling the pressure Ferguson was under, the probability is that a 1–0 victory at Forest in the third round of the FA Cup saved him. The Independent (UK). 1997-05-08 [2013-12-03]. ^ 36.0 36.1 Ferguson, Alex. Managing My Life: The Autobiography. Coronet Books. 2000. ISBN 0-340-72856-6. ^ The highs and lows of Roy Keane's career. The Guardian (London). 2009-04-23 [2011-07-13]. ^ THE LONGEST BANS IN ENGLISH FOOTBALL. The Independent. [2013-11-27]. ^ 39.0 39.1 39.2 Sir Alex Ferguson. [2013-11-27]. （原始内容存档于2013-12-02）. ^ Pike, Keith. Ferguson watches seeds of doubt grow. The Times (London). 1995-08-21: 23. ^ Hansen, Alan. Sir Alex Ferguson 25 years: 'You can't win anything with kids'. BBC Sport. 2011-11-02 [2013-05-09]. ^ Maddock, David. Ferguson accepts four-year contract. The Times (London). 1996-05-17: 48. ^ Lacey, David. United take a stroll into semi-finals. The Guardian (London). 1997-03-20: 26. ^ Lacey, David. Ricken wrecks United's dream. The Guardian (London). 1997-04-24: 28. ^ 45.0 45.1 Barclay, Patrick. Football – Bloody Hell! : The Biography of Alex Ferguson. Vintage. 2010. ISBN 0-224-08305-8. ^ Ball, Peter. Sheringham handed Cantona's crown. The Times (London). 1997-06-28: 52. ^ Maddock, David. Berg signs up to improve United's case for defence. The Times (London). 1997-08-12: 44. ^ Shaw, Phil. United fail Leeds' intelligence test. The Independent (London). 1997-09-29 [2009-07-29]. ^ Lacey, David. Platt stalls United's march. The Guardian (London). 1997-11-10: 19. ^ Moore, Glenn. Now United can focus on Europe. The Independent (London). 1998-03-02 [2009-07-29]. ^ Melling, Joe. Wenger: Now do you believe me. Mail on Sunday (London). 1998-03-15: 104. ^ Hughes, Rob. Wenger leading English game towards exit from insularity. The Times (London). 1998-05-18: 31. ^ Melling, Joe. United reign over Solskjaer sent off as the title dream fades. Mail on Sunday (London). 1998-04-19: 100. ^ Maddock, David. Stam's arrival relieves the gloom for United. The Times (London). 1998-05-06: 41. ^ Wood, Stephen; Kempson, Russell. United smash record for Yorke. The Times (London). 1998-08-21: 48. ^ Finch, Julia. United head world rich league. The Guardian (London). 1999-02-03 [2011-05-13]. ^ Dodd, Vikram; Wilson, Jamie. Fans vow to fight Sky takeover deal. The Guardian (London). 1998-09-09: 6. ^ 電視運動轉播市場之分析：台、美、英三國職業運動轉播權利金的發展 (PDF). 國立政治大學. [2013-11-27]. （原始内容 (PDF)存档于2016-03-04）. ^ Staniforth, Tommy. United underline Cup withdrawal. The Independent (London). 1999-10-29 [2011-05-16]. ^ Shaw, Phil. United fall short of elusive century. The Independent (London). 2000-05-15: A2. ^ Man Utd confirm Barthez signing. BBC Sport. 2000-05-31 [2013-05-09]. ^ Taylor, Daniel. After the United fallout, Ferguson faces up to job and a half. The Guardian (London). 2001-05-21 [2013-05-09]. ^ Gaunt, Ken. Ferguson is reunited with Old Trafford board. The Herald (Glasgow). 2001-07-14 [2013-05-09]. ^ Ferguson is reunited with Old Trafford board. The Daily Telegraph (London). 2001-07-12 [2013-05-09]. ^ Ferguson, Alex. How a phone call killed Van Nistelrooy deal. The Times (London). 2000-07-25: 30. ^ Stam's United dream dies. BBC Sport. 2001-08-26 [2013-05-09]. ^ 67.0 67.1 Stam move 'down to cash'. BBC Sport. 2001-09-02 [2013-05-09]. ^ Wilson, Steve. Manchester United manager Sir Alex Ferguson doesn't rate Rafa Benitez. The Daily Telegraph (London). 2009-03-19 [2013-05-09]. ^ Kay, Oliver. Cantona returns to nurture club's youth. The Times (London). 2001-05-28: 25. ^ Sir Alex Ferguson: 'The notion of a retirement age is anathema to me'. The Guardian (London). 2013-05-07 [2013-05-08]. ^ Man Utd reach Rio deal. BBC. 2002-07-21 [2013-05-08]. ^ Old dogs, new tricks. GQ. 2011-06-14 [2013-05-08]. （原始内容存档于2012-11-18）. ^ Saviour Robins: Fergie just cannot let go. ESPN Soccernet, 2006-11-04. [2015-06-13]. ^ Wenger: Managers should emulate Ferguson. ESPN Soccernet, 2006-12-04. [2007-01-11]. ^ Bostock, Adam. Report: Villa 0 United 3. Manchester United F.C. 2006-12-23 [2007-06-18]. （原始内容存档于2008-12-24）. ^ Whittell, Ian. Ferguson: This is the best squad I've ever had. The Daily Telegraph (UK). 2007-11-12 [2007-11-27]. （原始内容存档于2007-11-14）. ^ Queiroz could step up to boss United when Sir Alex decides to call it a day. London: Mail Online (UK). 2008-05-25 [2008-05-27]. （原始内容存档于2008-05-26）. ^ Ferguson wants to end on a high. ClubCall. 2010-05-15 [2011-05-27]. （原始内容存档于2011年7月8日）. ^ 24 years not out: the making of an Old Trafford legend. BBC Sport. 2010-12-18 [2010-12-20] （英语）. ^ Ashley Young joins Man Utd from Aston Villa. BBC Sport. 2011-06-23 [2011-06-27]. （原始内容存档于2011-06-24）. ^ Manchester United confirm signing of David de Gea. BBC Sport. 2011-06-29 [2011-07-18]. （原始内容存档于2011-07-28）. ^ Man Utd rename Old Trafford stand in Ferguson's honour. BBC News (British Broadcasting Corporation). 2011-11-05 [2011-11-05]. ^ Sir Alex statue date confirmed. Manchester United F.C. 2012-11-06 [2012-11-06]. ^ Sir Alex Ferguson pride as Manchester United unveil statue. BBC Sport. 2012-11-23 [2012-11-23]. 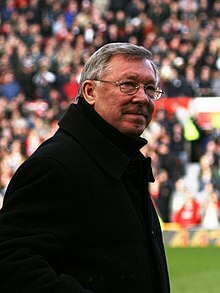 ^ Sir Alex Ferguson to retire as Manchester United manager. BBC Sport. 2013-05-08 [2013-05-08]. ^ Sir Alex Ferguson to retire this summer, Manchester United confirm. Sky Sports. 2013-05-08 [2013-05-08]. ^ Man Utd 2-0 Arsenal. BBC Sport (UK). 2004-10-24 [2013-11-28]. ^ Arsene Wenger misses Sir Alex Ferguson, believes Arsenal can top Manchester United. http://prosoccertalk.nbcsports.com/. 2013-11-08 [2013-11-28]. ^ Wwalker, Michael. Fergie's red mist: The truth behind that long-running rivalry with Liverpool. Daily Mail (UK). 2010-09-17 [2013-11-28]. ^ Magee, Andrew. Ferguson versus Mourinho: Five encounters between the legend and the Special One. Daily Mail (UK). 2013-03-04 [2013-11-28]. ^ Gibson, Owen. José Mourinho reveals his secret pact with Sir Alex Ferguson. The Guardian (UK). 2013-06-15 [2013-11-28]. ^ Harris, Nick. Ferguson will never talk to The BBC again. The Independent (UK). 2007-09-06 [2009-12-14]. ^ Sir Alex Ferguson Factfile. Manchester Evening News. 2006-11-06 [2009-12-14]. （原始内容存档于2012-09-03）. ^ Ferguson banned for two matches. The BBC. 2007-12-14 [2009-12-14]. ^ Ducker, James. Sir Alex Ferguson banned and fined £10,000. The Times (UK). 2008-11-19 [2009-12-14]. ^ Ferguson suspended and fined. London: The Football Association. 2011-03-16 [2011-03-16]. ^ Dad may have just won the league but he is a jinx... so I've banned him, says Ferguson Jnr as Posh prepare for relegation battle. Dail Mail. 2013-04-25 [2013-11-28]. ^ UK Politics | 'Luvvies' for Labour. BBC News. 1998-08-30 [2009-10-30]. ^ The socialist international. The Economist. 2013-05-11 [2013-05-09]. ^ Ogden, Mark. Ferguson provides food for thought. The Daily Telegraph. 2007-06-06 [2013-05-09]. ^ Campbell, Alastair. Sir Alex Ferguson supports Labour and says David Cameron's policies are 'about helping his own sort'. Daily Mirror. 2010-04-28 [2011-05-08]. ^ Good lord! Could United boss Alex Ferguson be made a top toff?. Manchester Evening News. 2011-01-27 [2013-05-09]. （原始内容存档于2013-12-03）. ^ MPs call for Sir Alex Ferguson to be made a Lord. Manchester Evening News. 2013-05-09 [2013-05-09]. ^ Sir Alex Ferguson honoured | News & Events | Manchester Metropolitan University. Mmu.ac.uk. 2009-07-14 [2013-10-04]. ^ News. Sci-eng.mmu.ac.uk. [2013-10-04]. （原始内容存档于2013-10-04）. ^ Sunni Upal. Sir Alex Ferguson at Harvard: Manchester United boss has nine honorary degrees | Mail Online. Dailymail.co.uk. 2012-12-19 [2013-10-04].